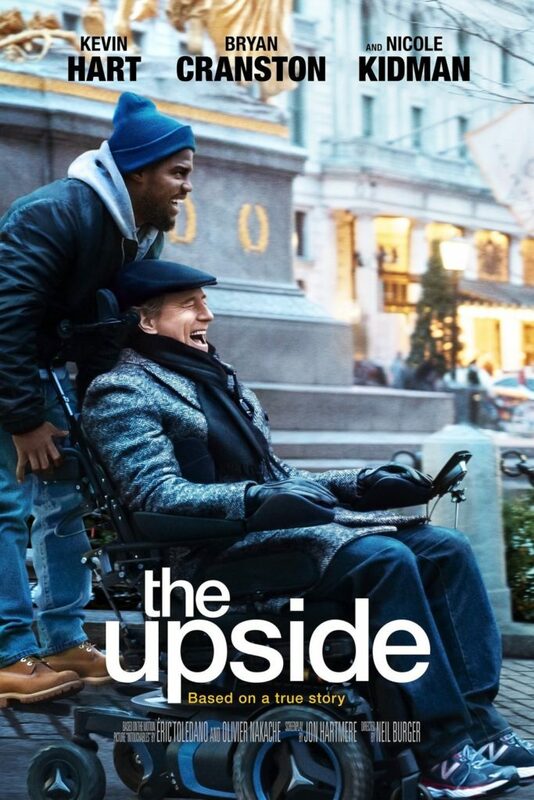 Having seen the French version of the “Intouchables” with French actor Francoise Cluzet and Omar Sy, my friend Flor and I ventured out to see a screening of the Americanized Kevin Hart version of the movie entitled “The Upside” directed by Neil Burger. Having enjoyed the 2011 French buddy drama that had its share of laughs, and became the second biggest box office hit in France back then, I thought let me see what Kevin Hart and Bryan Cranston made of their roles and I wasn’t disappointed. An out of luck, out of work, out of favor with his family ex-con, Kevin’s character Dell, hid behind a smart mouth and “What’s the Use” mentality. In order to get his unemployment he had to go on job interviews which he did half-heartedly, not really looking for a job, just signatures that said he was in search of one. Answering an ad for a janitor he finds himself on the tony side of New York in the home of a rich quadriplegic named Phil played by Bryan Cranston who saw something in Dell. Dell was totally unqualified for the job as Phil’s attendant but Phil hired Dell nonetheless. Since Phil could only move his neck, face and eyes, Dell found himself doing everything for Phil. Feeding, bathing, lifting and changing Phil’s catheter and cleansing other regions which made for some hilarious antics by Kevin who brought a lot of mischievousness to the role as he tried to master his position. Phil’s handicap and the loss of his wife did not give him much to live for and he had just about given up on life, although his faithful and straight laced secretary and administrator Yvonne played by Nicole Kidman tried to run things smoothly in Phil’s life. Harvard educated, Yvonne gave up better jobs to take care of Phil who obviously she felt some type of love for but does not reveal to Phil until the movie’s end. Having been incarcerated Dell’s relationship with his family is strained. He hasn’t spent much time with his ex-wife or his son. No job meant no support payments so his ex wasn’t hearing anything Dell had to say but “I’ll get you the money.” Especially, since their living situation was deplorable and their neighborhood drug infested. Dell’s relationship with his son was not much better but it seemed it wasn’t anything that couldn’t be cured by money. Eventually. Dell’s salary as Phil’s attendant more than compensated for his previous financial lack. There is clearly a racial and economic divide between Dell’s circumstances and Phil’s. From where Dell and his family live to where wealthy Phil resides playing his opera and buying expensive paintings. Not an opera buff initially Dell turns Phil on to Aretha and weed to ease Phil’s pain. Via Dell’s delight in experiencing a better side of life, he transfers a zest for life to Phil who hadn’t felt the joy of living in a long time. Dell’s enthusiasm in driving Phil’s cars, and taking showers in a state-of-the art bathroom was almost childlike and gave the jaded Phil a different outlook on life. Dell was always searching for something he could excel at coming up with nonsensical or at least unworkable ideas for apps and money making endeavors until discovering his mechanical talents at designing a wheelchair for Phil that made Phil more mobile. So much so, Yvonne and Dell talked Phil into a blind date played by Julianna Margulies. Other members of the cast include Aja Naomi King, Golshifteh Farahani, and Tate Donovan. The movie has its corny moments, its sap and yet its inspiring. I think folks who deem to watch it will enjoy it. I know Flor and I did! “The Upside” is out now at a theater near you.